Angel Message with Archangel Uriel! I am happy to share with you this new Angel Activation with Archangel Uriel that lovingly guides you through the process of connecting with the creative source energy of all that is. You will witness the balancing of your masculine and feminine forces within. You will also experience the cleansing and opening each of your chakra energy centers to their highest and best state. Archangel Uriel connects to assist you in this process so that you can open to experience your angels. Tune in through your open heart. Your psychic senses have always been here… Quiet your mind and open your heart to tune in… witness your psychic senses opening to their highest and best possible state. Simply Click the link below to listen to the free angel message, or right click to save to your computer (Ctrl Click Mac). Want to exist in an effortless, meditative flow? Keeping your chakras balanced and aligned will help you to achieve this! Take the new 3-minute chakra test by Chakra Master Carol Tuttle to learn which of your 7 Chakra energy centers are blocked and need tuning up. This angel message is now transcribed! Read it below; Or Scroll to the bottom of the page to access this guided chakra meditation on YouTube. At this time I invite you in joining me in taking a nice deep and relaxing breath and begin to focus within. Allow your breath to slow encouraging your mind and your body and your spirit to relax deeply. Enter in and open your heart. I ask that 100,000 angels and light surround us and that we are protected, supported, and assisted in connecting directly with the higher realms of spirit and truth. Open your heart and imagine now that your energy is being sent downward into the core of the earth. Allow yourself to connect with this earth energy, connected to the creator, connected to all that is. The power of joy and love are present here, tune in and allow yourself to feel this. And now feel this energy begin to move upward through the bottom of your feet, quickly touching and activating each of your chakras, including your higher energy centers, and now imagine that a sphere of light is all around you and that you are actually lifting up with the sphere, out of the world, into the light, above the light, above the universe, and into the creative realm of all that is. Let your breathing be slow and calm and let your consciousness now connect directly with the creator of all that is. Feel this connection, feel the divinity of this very moment, the infinite perfection. And I now invite the highest, most loving possible angel, archangel, or spirit guide to assist us in this time of new beginning, to empower us to claim our power through this opportunity to create blessings in the world, in our lives. Please come in, connect, and channel through me now. Indeed, dear one, I am here. I am Archangel Uriel and I am honored and pleased to assist you as you embark upon a new journey. The energy at this time strongly supports you in releasing old programming, old beliefs and patterns of thought, or feeling, or emotion that no longer serve you in accomplishing your dreams and awakening now to new perspectives in spirit, in light. Allow yourself to remain focused upon your heart at this time, but letting your energy lift and soar, letting yourself be big in spirit, your full light funneling into your body, into this moment. Allow your masculine and feminine energies to rebalance to their highest and greatest good, allowing the masculine/feminine energies on the planet to rebalance to their highest and greatest good through you. For as you are learning, you make a difference. Your every thought, emotion, belief, feeling manifests the path before you. And so as you think, yes, now. As you allow the power of joy, the feeling of joy, to download into your experience and as you allow your masculine and feminine energies to balance encouraging women to fully stand in their power and prompting men in the masculine to be grounded in their heart, honoring mother nature, collaborating with the earth and the natural world, it is imperative now that you update your beliefs taking inventory and releasing that which no longer serves. And I, Uriel, assist you now in cleansing, in budding, and in opening and blossoming like a flower each of your chakras to their highest possible good. And so we will begin with your crown at the top of your head slightly above your head. Let your attention be focused therein. This is your prophetic chakra, your crown chakra that enables you to stay in constant connection with the outer universe, with the realms of spirit, and the subtle dimensions of spiritual energy. Feel, sense, see, and know this connection. Your crown chakra is connected to the whole of all creation, to all that is. And as your crown chakra buds, opens, and blossoms now like a white lotus flower, imagine the energy of the creator of all that is streaming in, strengthening your connection, opening and balancing this energy center for the highest and greatest good so that you may clearly know divine love at all times and be guided by your prophetic sense in your physical life. And now, beloved, imagine your focus move to your third eye. As this energy center is activated, you may feel a tingling, a slight pressure, or you may begin to see the color purple. As your third eye chakra of intuitive sight, of clairvoyance, intellect, belief, understanding, this chakra allows you to effectively analyze your reality and psychically know with your mind’s eye your next step and your highest good. The center can help you to see the beliefs that no longer serve you so that you are able to identify and witness their release into the creator’s light. Imagine your third eye chakra now begins to bud like a flower. As energy flows this way, it now opens and blossoms, balances to its highest and best use for you right now. Imagine your third eye in between your eyebrows as a beautiful violet flower. Open your intuitive, clairvoyant sight. And now draw your attention, beloved one, to your throat chakra as we flow energy this way to open your chakra of communication, allowing you to clearly speak divine love. Allowing you to know the truth of your inner identity, the truth of who you are in spirit, in soul, in love. Imagine your throat chakra budding, opening, and blossoming a beautiful blue flower open to the highest and best good so that you are able to clearly speak your truth, clearly speak divine love, open to your telepathic ability for the highest and greatest good. Witness this blossoming of your throat chakra and so it is. We now flow energy unto your heart. Feel this light come in, notice your heart chakra begin to bud, to open, and to blossom like a flower to its highest and best state. 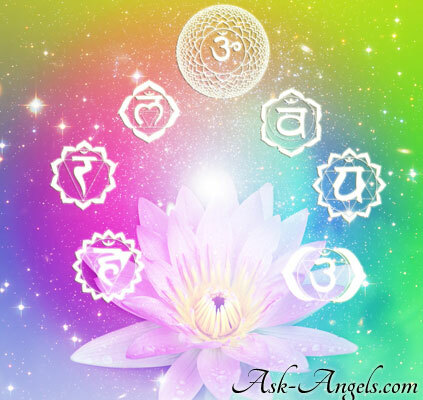 Your heart chakra, indeed, allows you to directly connect with the angelic realm. It is also your chakra of balancing your emotional levels. Allow this center to be balanced now. Allow strong emotional peaks that no longer serve to be washed away, and allow this green, emerald flower to be cleansed and illuminated for your highest and greatest good. Witness this cleanse and witness this energy center blossoming. A flower fully open, absorbing the light of love and of the higher realms. We now attune you to your solar plexus energy center. This is where your psychic senses are held in the form of your gut feeling. Slightly above your belly, notice this energy center bud, open, and bloom a golden beautiful sunflower absorbing the light of the creator and opening to its highest and best state allowing your psychic intuition to clearly be felt in your gut, allowing you to know if your choices and actions indeed propel you towards where you want to head. And now we draw your attention to your sacral chakra. The sexual energy of abundance, your sacral chakra is associated with the qualities of movement and the flow of energy. As energy is flowed this way, witness this energy center being cleansed of all that no longer serves and now budding, opening, and blossoming to its highest and best state. A beautiful orange flower takes form so that you can effortlessly flow energy, move with the natural rhythms of the universe, and align fully with your abundance, indeed. And, finally, beloved one, now we flow energy to your base, your root chakra. Imagine this energy center, once more, as a flower as it is cleansed and then buds, opens, and blossoms, grounding and connecting you firmly and safely to the earth who loves and supports you. This chakra is the support for all of your other energy centers including your higher chakras, which we have not yet touched on. This root chakra deals with abundance as well, and it grounds you to the world so that you are able to successfully exist within. Imagine a clockwise motion of energy as this chakra is opened and as it blossoms to its highest and best state. Now, above you, notice that light, waterfall of light, streams down rinsing away any residue that was brought up, cleansing and opening your higher chakras and balancing out each of these 7 flowers, your psychic energy centers, allowing you to sense the subtle vibrations of the many spiritual dimensions accessed from the physical realm. This waterfall of light clears your energy field and, indeed, places a shield around you and so that as you move forward from this visualization, you are protected and you are safe. You are in your bubble not influenced by negativity of the world around you. You are able to stay centered in love, balanced masculine and feminine, balanced emotions. Remember your every moment, your every feeling, your every belief, indeed, form your world around. You are cleansed, you are lifted, you are empowered. Claim your energy as creator. Release those beliefs you notice that do not serve and know that they will come up for you at this time. They will come up for you in the cycle, you will know the areas in which you are limited. And when you identify a belief that does not serve, go up and directly connect with this divine energy of the higher realms, notice the belief, and release it into the creator’s life, the creator’s light, inviting a new, updated, empowering belief to take its place. Repeat this process and know that you are able to balance your life in all ways with the energy of divine love claiming your rights. As you and your world move into what is uncharted territory, you have not been here before, you are learning as you go, but all things are possible, and with love you are not limited. Notice that the waterfall of light is still streaming all around you and now let your consciousness flow with this light, with this water, grounding, once more, into the energy of the earth, the core of the earth. Go to the center of the earth and notice the light burning brightly therein, connected to all that is. Feel the divinity of this moment, of your connection with the earth. And now, when you are ready, feel yourself drawing earth energy up, up through your base, your sacral, your solar plexus, your heart, your throat, your third eye, and your crown. Return to your physical body. Know that your psychic senses have been recharged, use them often. The more you tune in to your intuition, your prophetic sense, your clairvoyant sight, the more you speak divine love, connect with your angels, open your heart, trust in your gut, flow with the natural flow of the universe, the more heightened and sensitive and powerful your senses will become, be aware, center, and tune in. When your mind is calm, your psychic senses can operate in their full form. You have these senses for a reason, to guide you through this uncharted territory, to guide you through the process of releasing beliefs and updating them with new ideas of the empowered being that you really are. Now is your time. And remember to live moment by moment, for it is in every moment that you are creating. Return to the knowing of your spirit and sense the subtle energies of the spiritual realms. Call upon your angels for assistance, we are here to assist, to love, and to guide, to help you know your full power as a spiritual being. Tune in, be aware, and take your next step forward with unconditional love. I am archangel Uriel and you are so loved in this very moment and always. Let this love flow through you and let it infuse your light with blessings. I leave you with my blessing and with one more thought: tune in, your psychic sense have always been here. And when you quiet your mind and open your heart and open all your chakras, letting them blossom like flowers to their highest and best possible state, all senses will assist you in creating and embarking upon this new journey, spiraling into the new. You are so loved, you are so loved, you are loved. Goodbye for now. Thank you, Melanie. I could feel a divine love coming over me, and a relaxing and joyful feeling. Thank you so much for these wonderful angel messages Melanie. I feel great love listening to them. Thank you Melanie. Just divine!